Sophie's Space: The Amphibian Unitard -- complete! I finally finished the amphibian unitard! Yay! 1. Patterned the unitard -- I checked all the measurements in comparison to the dress form I was using and to the unitard I had already made to make sure the ratios looked correct. I draped a hood pattern and melded that with the unitard to create a hooded unitard. 2. Dyed the fabric -- I dyed the white miliskin a neon green and dark blue. For the green, I mottle-dyed the fabric with blue and yellow, using shibori and selective dipping of the fabric. I then over-dyed the whole thing with florescent yellow. The dark blue/green is a combination of navy blue, turquoise, and green...it all got a little too dark, but I think it's fine. 3. Silicone-spotted the blue pieces -- At first I just made sheets of fabric with silicone...then I found that it was way more efficient and controllable to cut out the pieces and then silicone them instead. 4. 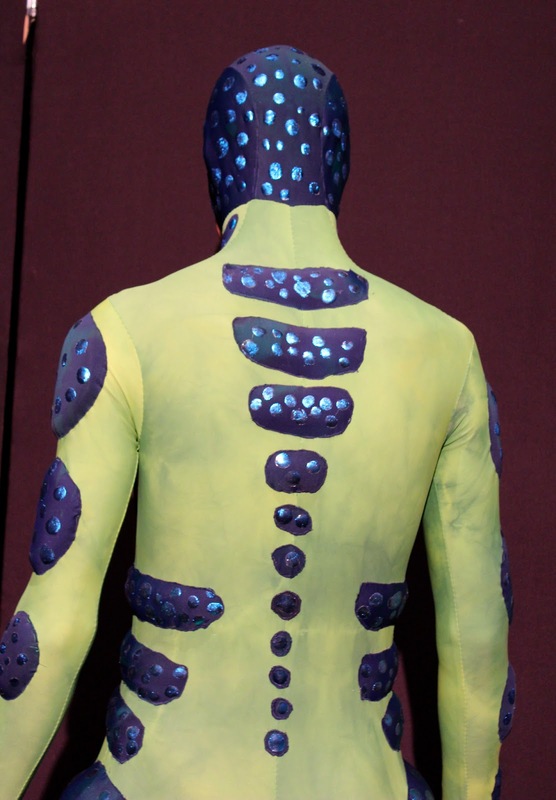 Stitched the unitard together to make sure it fit and to place spots. 5. Basted on foam. Basted one layer of miliskin over the foam and finally basted the silicone-decorated material over that. 6. Took unitard off the form -- took out basting stitches so that unitard could lie flat. 7. Machine-appliqued the dots into place using a walking foot -- this was extremely challenging! I had to use the walking foot or it just didn't move, but fitting everything under that foot as well as the machine was probably one of the most exhausting things I've sewn! 8. Stitched the unitard back together. 10. Stitched on the hood. 11. Prepped the sleeves with thumb-gloves. 12. Stitched on the sleeves. And there you have it! A great learning experience building something completely from the bottom up. I had a lot of fun making this and I'm really happy with how it turned out! And thank you to David for being an awesome model!